CRISPR-AnalyzeR.org offers you a web-based analysis plattform for your pooled CRISPR Screens. × CRISPRAnalyzeR 1.50 is out. × Please note that this is a live demonstration only. Explore your Data, Explore your Analysis. CRISPRAnalyzeR is a web-based analysis platform for pooled CRISPR screens. CRISPRAnalyzeR was developed with user experience in mind and provides you with a one-in-all data analysis workflow. And once you are finished, you can download all the data as well as your analysis as an interactive HTML report. You can use our online web service, but also download CRISPRAnalyzeR to install it on your local computer or within your lab/institute. CRISPRAnalyzeR is open-source and free for non-commercial use, please check out the download pages below. As a first step, you need to upload your sequencing files and your sgRNA library file - both are required for the data analysis. Sequencing files can either be read count files ( .txt - please check the format) or zipped FASTQ files ( .fastq.gz). In case you like to try out CRISPRAnalyzeR without your own data, we have some sample data ready for you. All you need to do is download one of the sample data files, extract them - everything you need is included. Each data package consists of a sgRNA library file (.fasta) and NGS rawd ata (.fastq.gz) or read count files (.txt). In this package you will find 4 readcount files and a sgRNA library FASTA file. In this package you will find 4 .fastq.gz NGS files and a sgRNA library FASTA file. In this package you will find 3 read count files and a sgRNA library fasta file. You can upload NGS FASTQ.gz sequencing data or Read Count Files (.txt) in addition to your sgRNA library file (.fasta). The sgRNA library file must be provided in a FASTA format. This library file is not only used to identify the genes to which your sgRNAs belong but also allows CRISPRAnalyzeR to annotate your screen correctly. Example files for the most common sgRNA libraries can be downloaded from below at the end of the help section. Your screening data can be uploaded either as gzipped NGS FASTQ (.fastq.gz) or tab-separated Readcount(.txt) files. In case you upload FASTQ files, CRISPRAnalyzeR uses bowtie2 to map the FASTQ reads against the provided sgRNA library file. More advanced users can adjust bowtie2 parameters in the FASTQ Options Box at Step 3. Since FASTQ files are large, we would ask you only upload gzip-compressed files as they are usually provided by your sequencing machine. In this case, the files should end with .fastq.gz. Otherwise, please compress them using gzip first. You can upload tab-separated read count files, in which every line contains a unique sgRNA identifier as well as the number of reads assigned to it. Please note that the sgRNA identifiers must be the same as in the sgRNA library file you provide. Since CRISPRAnalyzeR performes the the normalization, you can upload raw read count files. In case you upload FASTQ files instead of Read count files, your FASTQ data is extracted before the identification of your single sgRNA reads. For this purpose, CRISPRAnalyzeR needs to know how your FASTQ files do look like and how it can identify the barcode of each single sgRNA. By default, this barcode is the 20 nt target sequence as it is defined in the sgRNA library file you uploaded. To extract this information from your sequencing data, CRISPRAnalyzeR requires a so-called regular expression. For your convenience, CRISPRAnalyzeR already provides you with pre-defined settings for the most common libraries and vector systems. As an alternative for more advanced users, you can also type in your own regular expression. CRISPRAnalyzeR offers you pre-made sgRNA library fasta files for commonly used CRISPR libraries. Please email us if you want your sgRNA library file to be distributed with CRISPRAnalyzeR. sgRNA library files must be in FASTA format and include a unique sgRNA identifier as well as the guide target sequence (typically 19-21 nt) in 5'->3' direction. A single item within the FASTA file consists of two lines. In this case it is the the sgRNA identifier with its target sequence. The first line is used to identify the item. It always starts with a > followed by the sgRNA identifier. The second line provides the corresponding sgRNA target sequence without the PAM sequence . Regular Expressions are used to extract the gene identifier from your sgRNA identifier. This is important as we want to provide you not only a gene-based analysis, but also additional visualizations and information about your candidate gene. To find a matching regular expression, you need to know the structure of such an expression and of course, the structure of your sgRNA identifier as it is used within your library file. Regular expressions for our pre-made libraries can be found below . CRISPRAnalyzeR provides you with pre-defined regular expressions for commonly used vector systems. Alternatively, see below how to find the correct expression for your custom library. A Regular Expression is used to detect both the gene and sgRNA identifier for each sgRNA within your library file. Note the brackets which are necessary. Regular Expression for the pre-made library FASTA files are provided below. You can also provide raw data NGS files directly from your sequencing machine in a FASTQ format. Since FASTQ data can be large, the files which must be compressed using GZIP (.fastq.gz file ending). CRISPRAnalyzeR extracts all information from your FASTQ NGS file and performs the mapping against the sgRNA library file. Please make sure the FASTQ extraction pattern in Step3 matches the vector system you used for screening. In order to find the sgRNA target sequence (which is used as a barcode to identify the sgRNA), CRISPRAnalyzeR needs to know where to find it within your sequencing data. For this purpose, regular expressions are used to extract this information from your sequencing rawdata. You can have a look at the plasmid map of the vector you used and try to identify the left and right flanking sequences next to the sgRNA target sequence (as illustrated below). Alternatively you can use one of the pre-defined settings depending on your vector system. Regular Expressions are used to extract the sgRNA target sequence barcode from your NGS FASTQ file. To find a matching regular expression, you need to know the sequence or name of the vector you used for performing the lentiviral transduction. All you need to do is select a couple of bases flanking your sgRNA target sequence on the left and right side. CRISPRAnalyzeR provides with pre-defined settings for the most common screening systems (see below), but you can use your custom system as well. Just tick the checkbox and enter a custom regular expression. You can select pre-made settings for various CRISPR Screening libraries available from Addgene. You can download pre-made sgRNA library FASTA files from the help section. Please upload your sgRNA library file that contains all sgRNAs used in the screen. It must be in FASTA format. The regular expression depends on how you designed the sgRNA identifiers within your sgRNA library file. For more information please see the help where you can also download pre-made FASTA library files. This is how CRISPRAnalyzeR detects the gene from your sgRNA identifier. Please select the regular expression from the left dropdown menu or type in your own. You selected the correct regular expression in the case your gene is highlighted in blue colour. Do you want to use a custom regular expression for the FASTA library? This will override the default settings to the left and is only for expert users. Please check out the help or the tutorials section to find further information. By default, CRISPRAnalyzeR optimizes and performs consistency checks. If you have problems, you can disable the optimization procedure. The sample data can be used with the default settings. Compressed FASTQ files as they are provided by the sequencer. Please note: You can upload multiple files at once. In order to provide a good user experience, please rename your files to include only letters and numbers. The sgRNA identifier needs to be TAB-separated from the counts. The file needs be GZIP-compressed. This is relevant if you upload compressed FASTQ files. These defaults should work fine in most cases. Is data in FASTQ in reverse complement? If you have a really low overall read count, you can try to go down with these parameters and accept mapping mismatches. Do you want to use a custom regular expression? By default, CRISPRAnalyzeR prevents you from data analysis in case the alignment rate is below 30%. However you can override this to also use samples of such low quality. This is only for expert users. Do you really want to override the alignment quality check? By default, CRISPRAnalyzeR generates a FASTQ data quality report, which can take some time. However, you can turn it off in case you are in a hurry. By default, CRISPRAnalyzeR processes FASTQ files using a specialized tool for faster processing. In case you have issues with FASTQ extraction (e.g. all read counts are 0), you can try to disable the fast processing of FASTQ files and revert back to the old method. Review your uploaded data and download generated read count files or the quality report of your FASTQ files. How can I download read count files? You can download all read count files CRISPRAnalyzeR created for you. CRISPRAnalyzeR gives you the opportunity to download the read count files for your samples. In case you uploaded FASTQ.gz data, the read count files have been generated by mapping your sequencing data against your sgRNA library. If you come back to CRISPRAnalyzeR, you can then just upload the read count files together with your sgRNA library file, which is much faster. The read count files are tab-separated text files and come within a gzip archive. How can I download a quality report for my FASTQ.gz sequencing data? CRISPRAnalyzeR also provides an extensive quality report for your sequencing data. Welliton Souza and Benilton Carvalho (2016). Rqc: Quality Control Tool for High-Throughput Sequencing Data. What information is provided in the overview table? sgRNA Extraction Ratio The ratio gives an estimate of how many sequencing reads were extracted according to the selected regular expression. In general this should be higher than 80%. Reads Mapped To Reference CRISPRAnalyzeR maps your raw data sequencing files to your sgRNA library file and tells you, how many reads were mapped to your sgRNA library. Each sequencing read can be mapped only once (Aligned once), multiple times or it might be that a read cannot be mapped to your library at all. Reads passed Quality Threshold You select a quality threshold for the mapping of sequencing reads to the sgRNA library. This is the percentage of reads which have passed the selected quality criteria. Reads Used in Total This is the percentage of reads that is finally used for the data analysis after the sequencing data handling, which includes the extraction of sgRNA sequences, the mapping to the sgRNA library and the applied mapping quality threshold. For your convenience, just get the generated read count files. Read count files can be used the next time - which is much faster than using FASTQ data. Download the optional FASTQ QC report. This report is only available in case you uploaded NGS raw data. Tell CRISPRAnalyzeR which treatment groups you have, assign samples to it and adjust the gene annotation parameters. In order to assign samples to a group, the upload of your samples needs to be completed. You did a mistake? Don't worry, you can easily change the setup by clicking on the Change Setup button. Why do I need to set groups? CRISPRAnalyzeR performs hit analysis by comparing two groups, whith each group containing the corresponding samples. All hit analysis methods that are implemented in CRISPRAnalyzeR require the use of two groups that are compared. This means, you need to assign each sample to either one of the groups you would like to compare. As an example, this could be a Day0 vs a Day12 group or a Control vs a Drug Treatment group. How can I setup my treatment groups? You can increase the number of groups, but the minimum required number is 2. If you like you can also name each group. How can I assign my samples to the groups? You can assign each file to one group by clicking on the sample name. If you like to have more than one file per group, keep the CMD or CTRL button pushed while selecting the samples. Please note that your are not allowed to use the same sample in more than one treatment group. Why do I need to set gene identifiers? CRISPRAnalyzeR needs to know in which organism your screen was performed and which gene identifier is used in the sgRNA library file. With this information, CRISPRAnalyzeR can offer you extensive gene annotation and visualizations. CRISPRAnalyzeR expects the type of organism, the gene identifier and which identifier you would like to convert it to. If you do not want to convert your gene identifier, please select the same identifer twice. Step 1: Which treatment groups do you have? Please set the number of treatment groups within your screen and adjust their names. You can select the treatments groups you like to compare in the Set Analysis Parameters section later. Please assign which of the uploaded samples belongs to which treatment group. One sample can only belong to one treatment group, you are not allowed to assign two different groups to the same sample. We strongly advise you to have replicates, however you can still run the analysis even with a single sample per group. Please note: Analysing data without at least two replicates per sample is not advised since most analysis methods do not work properly without replicates. CRISPRAnalyzeR converts the gene identifier for easier usage, so please select the type of gene identifier within your sgRNA library file. If you want to stay with your gene identifier, just select the same identifier twice. Please note: Gene ID conversion is done using the Ensembl BiomaRt service. Please don't forget to click. You can always change the settings by clicking on the Change Setup button. In the settings tab all important parameters for the Hit Analysis are set. Moreover you can define control genes and select which of the groups you defined are compared. All information from the Data Upload and Setup page remain unaffected. How do I setup screening controls? Positive controls are genes, for which the screening outcome is known. These will tell you whether your screening setup worked and are very important to judge your screening performance. Which gene can be used as a positive controls strongly depends on the type of screen. For Viability/Dropout screen, essential genes can be used as positive control. Non-targeting controls are articicial genes, which are not present in the screened organism. Since these controls don't have any target in the screening organism, they can be used to judge the screening variability. Common non-targeting controls are GFP or random sgRNA sequences. For each algorithm, you can set a p-value threshold that is used to discriminate between significant and non-significant hit candidates. Wilcoxon analysis is based on a Mann-Whitney test between a random/non-targeting sgRNA set and all sgRNAs for each targeted gene. If no non-targeting controls have been set, randomly picked sgRNAs are used as test reference instead. For this analysis, the DESeq2 package is employed on gene-level read count to find potential hit candidates between the treatment groups. Dai et al. (2014) edgeR: a versatile tool for the analysis of shRNA-seq and CRISPR-Cas9 genetic screens, F1000Research, 3:95. Can I remove low / high read counts from the analysis? 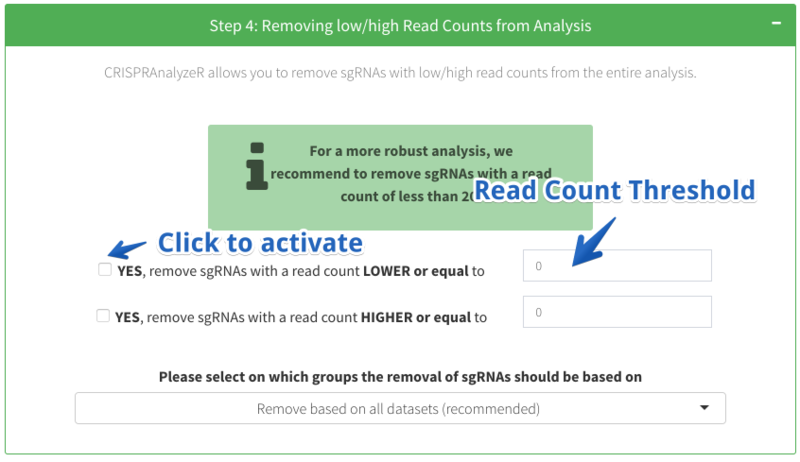 If you like to remove sgRNAs with low or even high read counts from your analysis, just activate the checkbox and tell CRISPRAnalyzeR the desired threshold. Each sgRNA having a read count below/above or equal to the threshold will be removed from the analysis. How can I analyze two groups? You can select the two groups out of all groups you have defined on the Set Groups And Identifier page. Can I run multiple analysises? CRISPRAnalyzeR always runs a pairwise analysis between two groups. If you want to compare additional groups, you can always come back to the Set Analysis page and click on the Change Setting button at the bottom. This allows you to change all analysis parameters and start a new analysis without uploading the data again. Controls are important to judge the screening results. Please enter the Gene Identiiers of your controls, separate multiple genes by comma (','). CRISPRAnalyzeR supports 6 different analysis methods which will be used to analyse your screen. Please define the p-value cutoffs for each individual analysis. From our experience, the p-value threshold for DESeq2 should be set very low. If you did not specify non-targeting controls Wilcox will use randomly picked sgRNAs. You can define the range in which you expect the BAGEL cutoff. Do you want to run ScreenBEAM data analysis? This will increase the analysis calculation time by at least three times. You can change the default calculation parameters of ScreenBEAM. Changing these parameters will lead to increased/decreased calculation times! CRISPRAnalyzeR will compare the following two groups. Please note that you can only compare two groups at once. If you have more treatment groups, you can always come back to this page and run pairwise analyses. CRISPRAnalyzeR allows you to remove sgRNAs with low/high read counts from the entire analysis. For a more robust analysis, we recommend to remove sgRNAs with a read count of less than 20. In case you provided NGS Fastq files, you will find visualizations of the sequencing quality on this page. What do the plots tell me? CRISPRAnalyzeR uses the Rqc Bioconductor package to provide you with FASTQ quality information. Souza W and Carvalho B (2016). Rqc: Quality Control Tool for High-Throughput Sequencing Data. 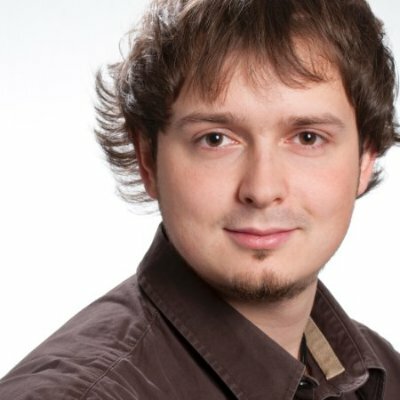 R package version 1.8.0, https://github.com/labbcb/Rqc. Shows the quality score proportion per cycle. Colors are presented in a gradient Red-Blue, where red identifies calls of lower quality. Describes the proportion of each nucleotide present at every cycle of sequencing. Shows the proportion and frequency of sequencing reads. Describes the length of reads within the sequencing file. In case you like numbers, this is the tab for you. Here you can have a look at raw numbers of your screen and get a feeling for the quality of the screen. In all Screening Quality plots these numbers are used for generating the plots. The number of sgRNAs/Genes which have a read count of 0. In case the uploaded sgRNA FASTA library contains more items than the screening data, these sgRNAs/Genes will reported as missing. The Readcounts tab allows you to browse through your readcount data. You can also sort according to the different columns and search for specific genes or sgRNAs. On the left you can select whether you wish to browse readcounts per sgRNA or get a summed-up readcount per gene. Described the log2 read count distribution for all sgRNAs of each dataset. You can zoom into the plot by keeping the left-mouse button pushed. Moreover, you can select/deselect any dataset by clicking on the dataset name below the plot. If you have set either positive or non-targeting controls in the Set Analysis Parameter section, read statistics for these controls are shown. Shows the read count of each gene divided by the number of sgRNAs that contributed to it. This is used to give you an idea of read count depth normalized to the number of sgRNAs. The Read Depth plot shows you how many reads fall onto every gene present in your dataset. Positive controls (if set) are highlighted in red, non-targeting control (if set) are highlighted in blue color. You can zoom into this plot for a closer inspection. Below you find the log2-transformed, normalized read count distribution for each sample. Depending on the treatment stringency, e.g. in resistance or dropout screens, the data can show asymmetry. Click on legend to exclude/include data. Drag rectangle to zoom. Below you find the normalized, log2-transformed read count distribution for each sample in a boxplot representation. Click on legend to exclude/include data. Drag a rectangle to zoom. Below you find the log2-transformed, normalized cumulative frequency for each sample. If you specified any controls, this is how the read count statistics for those look like. This plot shows the read count per gene normalized to the number of sgRNAs for this gene. However, spikes within the treated datasets indicate a read count enrichment per sgRNA for this particular gene. Controls are highlighted in red and blue. Drag a rectangle to zoom. Here you can browse all read count information for each sample either on sgRNA or gene level. Don't forget to download the read count files from the Data Review section. A gooed coverage is a key to successfull CRISPR screens. Here you can check whether all sgRNAs are still present in your samples. It shows you how many sgRNAs/Genes were not present in the screening data and how many sgRNAs per gene are present at all. The missing sgRNA/Genes tab shows you how many sgRNAs/Genes were not present in the sequencing data compared to the uploaded sgRNA library file. This means the read count for this particular sgRNA or the sum of sgRNA read counts for a particular genes is 0. If a read count threshold has been applied, removed sgRNAs are NOT listed as missing. Number of Genes in which all sgRNAs were not present in the dataset compared to the provided sgRNA library. Number of sgRNAs which revealed a read count of 0 in the dataset. 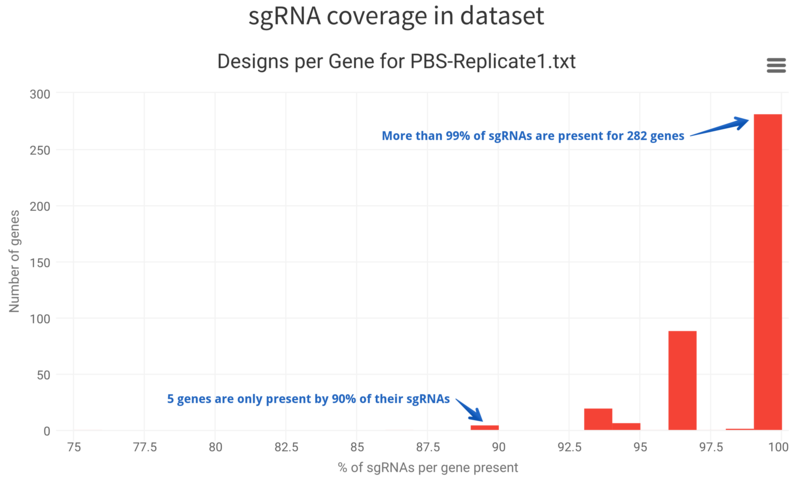 The percentage of sgRNAs, which belong to the non-targeting control, that were not present in the dataset. The percentage of sgRNAs, which belong to the positive control, that were not present in the dataset. Distribution of sgRNA presence for all genes in the dataset. In case all sgRNAs for all genes are present, you will expect only one bar. How many sgRNAs/Genes were not covered in your samples according to your sgRNA FASTA library? This number of genes did not result in any read count and are therefore considered missing in the respective sample. This number of sgRNAs did not result in read counts and are therefore considered missing in the respective sample. Percentage of missing sgRNAs among the genes specified as non-targeting controls. Percentage of missing sgRNAs among the genes specified as positive controls. These plots provide and overview of the representation of sgRNAs per gene within your data. In case every gene is covered by all sgRNAs, you will see just a single column at 100%. Moreover, genes with a low percentage of present sgRNAs might also show a reduced read count. For sure your screen was done in replicates. But how well are your replicates? This page will give you the answer as an Overview, or more detailed incase you are patient. Here you will find a boxplot visualization of the log2 Foldchanges or Z-Ratios between all uploaded samples on both gene and sgRNA level. This gives you a fast overview to check for outlying samples, that might have an unexpected influence on the analysis of your data. These plots allow you to directly compare two samples by both log2-Foldchange and Z-Ratio. With this you can inspect how foldchanges differ between your screning replicates. The grid gives you a fast overview of the correlation of your replicates. You can view the correlation for both sgRNA and Gene read count. CRISPRAnalyzeR calculates the Pearson as well as the Spearman coefficient. For a more detailed view, have a look at the compare datasets tab. If you are interested in a more detailed view, you can select two datasets or treatment groups and compare them on either gene or sgRNA level. You can highlight positive or non-targeting controls which will shown in red or blue color respectively. Moreover you can select multiple genes which will be highlighted in orange color within the scatterplot. For gene-based levels, please tick the 'Show the plot with gene level read count'. Moreover, you can get all scatter plots with log10-transformed data. Overview of log2 Foldchanges and Z-Ratio for all Sample Combinations. Please select the comparison of interest. This scatter plot matrix gives you an overview of all dataset comparisons at once. Please have a look the options below. You can download the image with a right click -> Save As and also add the actual plot to your CRISPRAnalyzeR Report by clicking on the Add Report button. Here, you can take a closer look at each dataset pair. Depending on the size of your screen the scatter plot may take some time to show up on your browser - please be patient. Highlighted genes will be shown in orange color. A principal component analysis can give you first idea how similar or differential your samples are and which of the samples you provided nicely group together. A principal component analysis is a method to reduce multi-dimensional data into two-dimensional projection by keeping the information about the variance in the dataset. It tries to identify directions, for which the variation is maximum. These directions are called principal components. You can download the plot using the upper right menu. Moreover, you can zoom into the plot for a more detailed view. Large datasets can be visualized using a heatmap, which gives you an overview of how your data looks like. CRISPRAnalyzeR offers different heatmaps to visualize your data. What Heatmap Visualizations can I use? CRISPRAnalyzeR provides you different settings to adjust the heatmap visualization. CRISPRAnalyzeR offers you six different types of heatmaps visualization. In addition, you can use K-Means clustering within selected heatmap types. Heatmaps allow you to look at your data in a structured way in order to check how your screen performed. The gene abundance heatmap takes the read count of all sgRNAs for a given gene and calculates its fraction (in %) of the whole dataset. With this type, the normalized read count for all sgRNAs of a given gene is summed up and visualized. Describes you how many sgRNAs for each gene where among the top or lowest 5 % of the dataset. This can be used to find potentially enriched or depleted genes. The sgRNA abundance heatmap shows you the percentage of read counts wihtin the dataset accounted for each sgRNA. This type describes the normalized read counts for each sgRNA in the dataset. You can zoom into the heatmap to inspect interesting regions more closely. In addition, you can save an image of the current view using the upper right menu. You can download the plot via the upper right menu within the plot and add it to your CRISPRAnalyzeR Report by clicking on the Add Report button. See Additional Information for a detailed explanation of all settings. In case you selected Gene Top/Lowest 5%, you can set whether you want to see TOP (enriched) or LOWEST (depleted) genes. This is useful if you have some outliers. With the logged color scale you will not only see those. Depending on the library size, heatmap calculation can take some time. Please be patient while CRISPRAnalyzeR generates it for you. CRISPRAnalyzeR performs data analysis using 8 different algorithms, which gives you a more sophisticated way to check for screening candidates. Take your time and have a look at each individual analysis method and compare them. Which hit calling algorithms are implemented in CRISPRAnalyzeR? CRISPRAnalyzeR offers you six different hit calling algorithm implementations to give you the chance to find the most robust hit within your screen. Since each algorithm performs the hit calling in a different way, we suggest you to have a look to all of them. Before CRISPRAnalyzer applies hit calling, all data is normalized using DESeq2. The Wilcox implementation is based on a two-sided Mann-Whitney-U test, which compares the sgRNA population foldchange (between your treatment groups) of each gene to either the population of the non-targeting control (if specified) or randomly picked sgRNAs. Finally a P-value correction according to Benjamini-Hochberg is applied to correct for multiple testing. 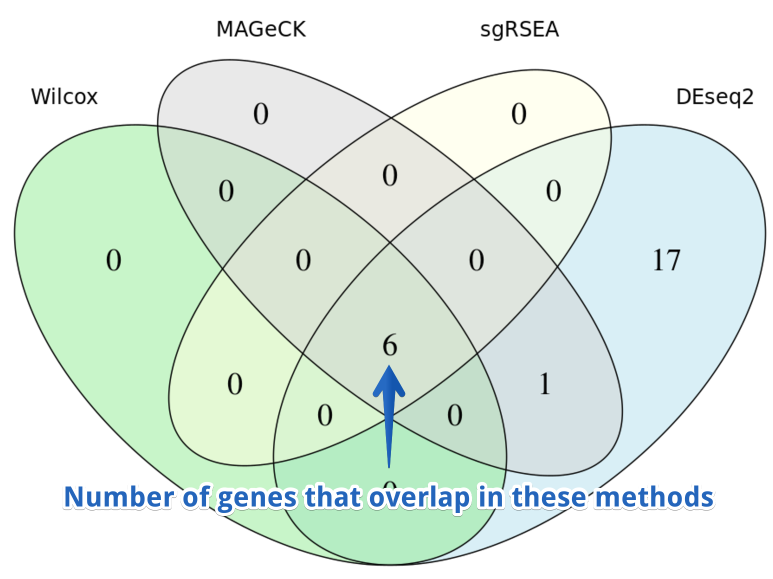 MAGeCK is a stand-alone algorithm to perform hit calling in pooled CRISPR screens. MAgeCK is based on a RRA ranking algorithm to identify hit candidates. Dai,Z. et al. (2014) edgeR: a versatile tool for the analysis of shRNA-seq and CRISPR-Cas9 genetic screens. F1000Research, 3, 95. The DESeq2 implementation is based on the DESeq2 R package. It uses the summed read counts of all sgRNAs for a given gene and tests for differential effects based on a negative binomial distribution model. In brief, eead counts for all sgRNAs are summed up to obtain the total read count per gene. DESeq2 analysis is performed on these read counts, which includes normalization, estimation of size-factors and variance stabilization using a parametric fit. A Wald test for difference in log2-foldchanges between both conditions is done to determine enrichment/depletion effects. For more information about DESeq2, please see the DESeq2 manual available at Bioconductor or the publication. Love MI, Huber W and Anders S (2014). “Moderated estimation of fold change and dispersion for RNA-seq data with DESeq2.” Genome Biology, 15, pp. 550. doi: 10.1186/s13059-014-0550-8. sgRSEA is based on the sgRSEA R package (Enrichment Analysis of CRISPR/Cas9 Knockout Screen Data), which is available at the R CRAN page. in brief, sgRSEA is based on a single-guide RNA Set Enrichment Analysis. First, sgRNAs are ranked by a signal-to-noise ratio. Then, the distribution of sgRNA ranks of a sgRNA set is compared with the overall distribution using a so-called enrichment score, which is based on a one-sided Kolmogorov Smirnov statistic and reflects the degree to which a sgRNA set is overrepresented at the top/the bottom of the ranked list. A Z-Ratio is calculated between your two treatment groups for each sample and was originally used for microarray data. The Z-Ratio has been implemented as previously published. What visualization does CRISPRAnalyzeR offer? CRISPRAnalyzeR offers you three different visualizations for all hit calling methods that have been implemented. CRISPRAnalyzeR performs the analysis to find more abundant (enriched) or less abundant (depleted) genes between your treatment groups. 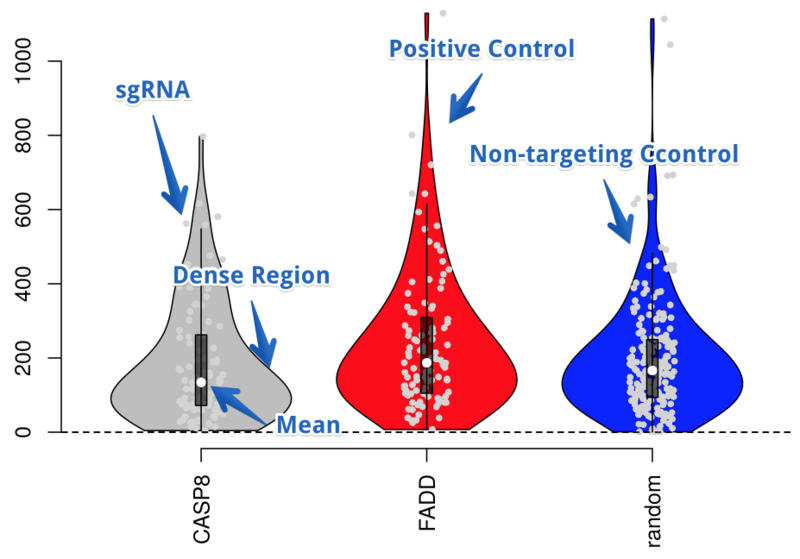 Genes which have shown a significant change, according to the p-value thresholds you have specified, are highlighted in red color in all plots. Wilcox analysis is based on the Wilcoxon Rank-Sum test. DESeq2 analysis is performed using the DESeq2 Differentially Expressed Genes workflow on gene-level read counts. Li,W. et al. (2014) MAGeCK enables robust identification of essential genes from genome-scale CRISPR/Cas9 knockout screens. Genome Biology, 15, 554. According to the publication, a Z-Ratio higher than 1.96 and lower than -1.96 indicates a possible candidate. Yu,J. et al. (2015) ScreenBEAM: a novel meta-analysis algorithm for functional genomics screens via Bayesian hierarchical modeling. Bioinformatics, btv556. This page gives you the overall view for each analysis method and allows you to do a compare-on-a-glance. Venn diagrams illustrate a hit candidate overlap for those that showed up below the defined p-value threshold in the different algorithms. How can I find overlapping hit candidates? In case you select an analysis method using the check boxes below, CRISPRAnalyzeR includes its results to show overlapping hit candidates. Genes are only considered as overlapping candidates between the methods, if they are below the p-value threshold of each method that you have set in the analysis settings. If there are no overlapping genes, reduce the number of included analysis methods and check the individial hit calling candidates of each analysis method. You can select which analysis algorithms you would like to compare - and whether you would like to have a look at enriched or depleted hit candidates. Remember that enriched means the gene showed a positive fold change between your treated and untreated group, and depleted indicates the exact opposite (a negative fold change). You can select and de-select methods and by this, get the common hit candidates among them. A Venn diagram provides you the information, how many genes overlap in the different analysis algorithms. The number within a shared area indicates the number of overlapping candidates between these methods. A detailed explanation on Venn diagrams can be found on Wikipedia. Exclude genes which did not show significant enrichment/depletion according to the checked methods. Compare your genes against the DAISY Core Essentials and known essential genes of various cell lines according to GenomeCRISPR. Hart,T. et al. (2015) Systematic discovery and classification of human cell line essential genes Cold Spring Harbor Labs Journals. 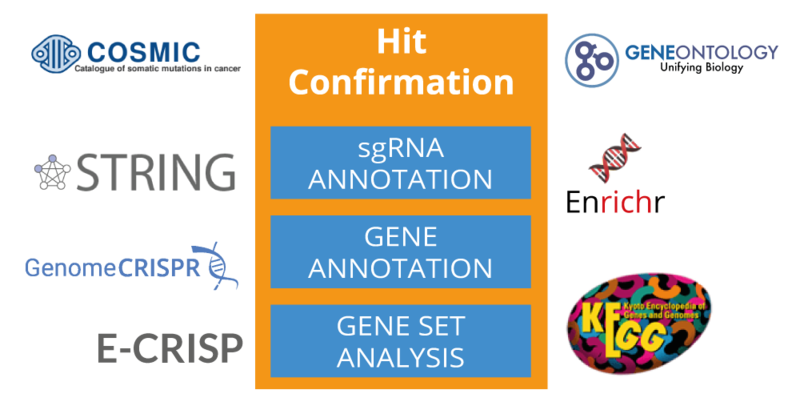 The Hit Confirmation section will provide you with more detailed information about your genes of interest. This includes individual sgRNA performance, a genomic model, predicted genome binding sites, predicted sgRNA scores as well as a brief overview for each individual gene of your screen. Why does CRISPRAnalyzeR reannotate sgRNAs? CRISPRAnalyzeR reannotates every sgRNA within your screen using E-CRISP. With this information, CRISPRAnalyzeR can generate additional information and plots for, e.g. the genomic model or potential genomic binding sites. General information about the selected gene are retrieved from Ensembl, EnrichR and KEGG. CRISPRAnalyzeR creates a genomic view similar to a genome browser, which includes gene or sgRNA information. You can check whether you gene of interest has been used in previously published CRISPR screens. Moreover, information about observed phenotypes is presented. CRISPRAnalyzeR gives you a brief overview of how the selected gene performed in your screen compared to all other genes. CRISPRAnalyzeR retrieves additional information about somatic cancer mutation from the Sange COSMIC database. Please visit the COSMIC website to find more information about the COSMIC database. CRISPRAnalyzeR retrieves additional information from the the Gene Ontology Consortium. Please visit the Gene Ontology website to find more information about Gene Ontology. After selecting a gene, CRISPRAnalyzeR will automatically start to retrieve all information. Just a quick overview about your gene of interest. Check out the gene model based on the Ensembl database. Find out the location and effect of individual sgRNAs for your gene of interest. It is nice to know about possible hit candidates, but how about the sgRNAs that were used to target these genes? On this page you can further investigate the performance and properties of sgRNAs targeting the select gene. The sgRNA section of the In-Depth Analysis allows you to have a closer look the performance and properties of individual sgRNAs targeting the selected gene. After you have selected a gene on the left, you can check the read counts for each sgRNA targeting the selected gene. Moreover, you can select to get the normalized or non-normalized, raw read counts plotted. Remember that you can zoom into the plot as well as select/deselect the samples by clicking on their names in the legend below the plot. This shows the fold changes of individual sgRNAs between your treatment groups in a log2-transformed visualization. You can sort the sgRNAs according to the log2 fold change. CRISPRAnalyzeR uses the re-evaluation feature of E-CRISP.org to reannotate your sgRNAs. This includes the analysis of predicted genomic binding sites, for which each sgRNAs is checked for potential genomic binding sites with a maximum of two mismatches and ignoring the first nucleotide base. The Z-Score or standard score is a z-transformation according to this calculation. E-CRISP.org also provides some external efficiency scores. For more information, please visit the E-CRISP website. Efficacy scoring as introduced by Doench et al. 2014 Nat. Biotech. Efficacy scoring as introduced by Xu et al. 2015 Gen.Res. CRISPRAnalyzeR provides you with the scores that E-CRISP.org calculates for each sgRNA. An overview of the presented scores can be found at the E-CRISP website. Here you can find an overview of your sgRNA target sequences, the fold changes, the Z-Score and the number of predicted targets for each sgRNA. Don't forget that you can download the table using the buttons at the upper left of the table. Similar to the genomic binding sites, the predicted sgRNA binding sites tells you if the sgRNA has predicted target within an annotated gene or between two genes (intergenic). In case a sgRNA targets the same target more than once, the predicted target is only listed once. Readcount of each sgRNA targeting the gene of interest. Foldchange of sgRNAs for the gene of interest. These are predicted binding sites of each sgRNA for the gene of interest. Some scores for each sgRNA for the gene of interest. CRISPRAnalyzeR offers you the enrichment of gene sets with interaction networks from the String Database as well as additional information from EnrichR and various other databases. Can I use several genes? Yes, you can select single or multiple genes to start gene set analysis. How is the Gene Set Analysis performed? Gene Set Analysis is carried out using the Enrichr API available at the Enrichr website. interactive and collaborative HTML5 gene list enrichment analysis tool. Kuleshov MV, Jones MR, Rouillard AD, Fernandez NF, Duan Q, Wang Z, Koplev S, Jenkins SL, Jagodnik KM, Lachmann A, McDermott MG, Monteiro CD, Gundersen GW, Ma'ayan A.
Enrichr: a comprehensive gene set enrichment analysis web server 2016 update. Nucleic Acids Research. 2016; gkw377. JASPAR Transcription Factor Binding Sites. CRISPRAnalyzer uses Enrichr to get Gene Ontology Gene set analysis from the Gene Ontology Consortium. CRISPRAnalyzeR asks Enrichr to retrieve data from the Online Mendelian Inheritance in Man® Database. Online Mendelian Inheritance in Man®. Retrieve genetic information about cell lines. You can get a protein interaction network using the String Database. Do you want to use pre-defined gene lists? You can add up to 200 genes for the analysis. The StringDB allows a maximum of 400 proteins. Please note that the plot requires several minutes of computation time depending on the number of interactions. It is nice to know about possible hit candidates, but how about the sgRNAs? This page provides you with a more in-depth view on the sgRNAs which you used to target your favourite genes. Compare the sgRNA populations of different genes using violin plots. Find out more about violin plots at Wikipedia. This violin plots shows the normalized read counts of each sgRNA for the selected genes within the samples marked as the untreated group. The width of the violine gives you an impression of the sgRNA population density. This violin plot shows the normalized read counts of all sgRNAs for the selected genes within the samples that have been set as part of the treated group. Shows the log2-transformed fold change of all sgRNAs for the selected genes between your treated and untreated group. Shows the z-score of sgRNAs for the selected genes. Displays the number of predicted genomic binding sites of all sgRNAs for the selected genes. Genomic binding sites are predicted using E-CRISP.org with ignoring the first nucleotide and allowing up to two mismatches in total. Select the genes you wish to compare. The more information, especially about annotated fateures, you get about possible hit candidates - the better. You can get annotation for multiple genes and compare these. Select multiple genes as a variety of external information to annotate your genes of interest. You can select multiple genes for which you would like to retrieve additional information. Just start typing the gene identifier and CRISPRAnalyzeR will show you the matching genes of your screen. How many Annotations can I add? CRISPRAnalyzeR allows you to enter up to 20 annotation features. Just start typing and CRISPRAnalzyeR will tell you which annotations match your input. just start typing what you would like to know and CRISPRAnalyzeR will show you mathcing annotations directly. Moreover you will find a list of all available annotations below. Which Genes do you wish to annotate? Select (multiple) genes of interest. Please select up to 20 different annotation features. The input supports instant search, so just type and find interesting annotations. CRISPRAnalyzeR not only provides you with individually plots and tables, but also gives you the opportunity to configure a report. CRISPRAnalyzeR automatically includes all plots and data of the screen quality section and the hit calling section. For all additional information, you can specifically add those information by clicking on the 'Add to Report' button to tell CRISPRAnalyzeR that you would like to have this included in the report. The download page will tell you which information was be added to the report. Here you also have the chance to include or not include complete sections, which can be usefull if you would like to generate a report that only contains specific parts of the analysis. Can I add additional information to the report? 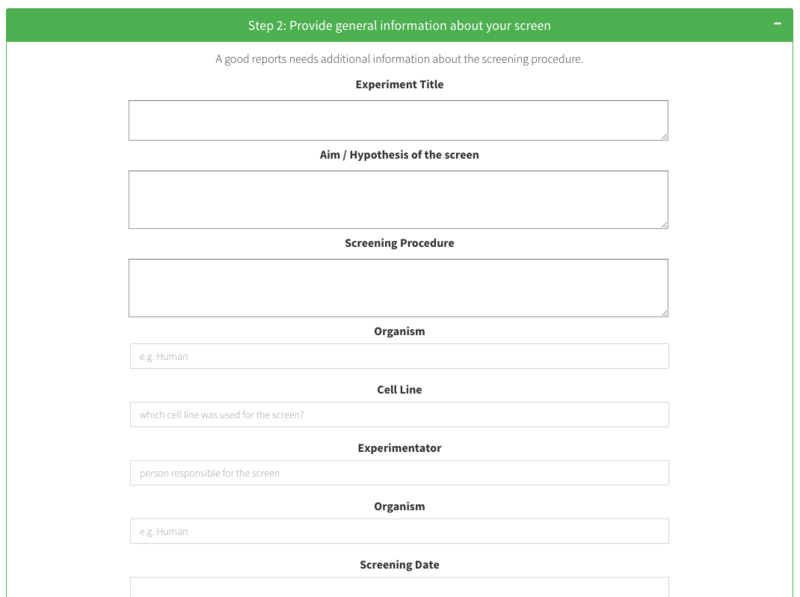 In step2, you can add additional screening information and comments to the report, such as a screening title, the screening workflow procedure, a hypothesis, the used cell line and many more. We advise you to include as much information to have a complete documentation of the screen. How can I download my report? The report is generated once you click on the 'Create HTML Report' button at the bottom of the page. The report generation will take some time, dependend on the amount of included data and plots - please be patient. In the meantime you can use CRISPRAnalyzeR, as the report is generated in the background and will be downloaded to your device automatically. You can get a full report including all data, which can be adjusted and downloaded on this site. Once you created plots and tables on this website, you can also download them as part of an interactive HTML file. Thereby, you not only have them organized in a single document but they are also still interactive, which is good for browsing and exploring the data offline. If you really like our plots and want to use them for a presentation or print them, you can always click on the download icon in the top right corner of each plot - this also works in the downloaded report. By doing this, you can convert a plot to a .pdf, .png or other formats. In general, CRISPRAnalyzeR will add all common plots and tables to the report. For all plots and tables that depent on your direct selection, you have to add these to the report by clicking a button. Throughout CRISPRAnalyzeR you will find the 'Add to Report'-buttons, which will add the generated plots/tables to your report. Include plots and tables that represent your screen in various ways. Include plots and tables of different differential expression analyses employed on your screen. A good reports needs additional information about the screening procedure. Please add further information in the text boxes above so CRISPRAnalyzeR can include them into your report. Depending on the size of your screen the report generation might take several minutes up to an hour. Please be patient - the report will be ready for download as soon as it is finished. For genome-wide screens, the report generation might fail due to memory limitations. You can find a solution at the Github page. Below you find tutorials on how to use CRISPRAnalyzeR or for specific settings you can adjust. Our main goal was to keep CRISPRAnalyzeR easy-to-use and straight-forward. But - to be honest - with each new user things might come up that might not be clear to the user or just don't work as intended. We apologize for any inconvenience and ask you to please let us know what struggled you. To provide you a fast and convenient way of asking questions, please join our Google Forum below. Please have a look into the google groups of CRISPRAnalyzer for additional help. Check out the CRISPRAnalyzeR google group. 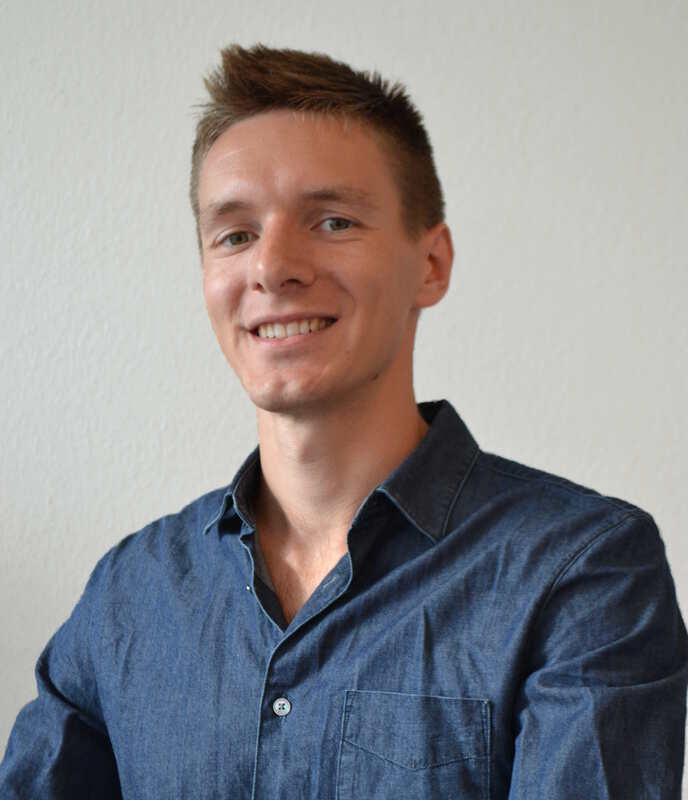 This application is a non-commercial project, which is funded and hosted by the German Cancer Research Center (dkfz). It is developed by Jan Winter and Marc Schwering. CRISPRAnalyzeR does not store personal information. All uploaded data is deleted immediately once the browser is closed or the connection is lost for any reason. CRISPRAnalyzeR only stores uploaded data for the time you visit the website. The report can be downloaded in the Report section. sgRNA plots about the selected gene were added to the report. Overview plots about the selected gene were added to the report. Comparisons about the selected genes were added to the report. Annotations about the selected genes were added to the report. Gene set enrichment analysis about the selected genes were added to the report. Your Report has been generated successfully. CRISPRAnalyzeR was not able to generate the report for you. In most cases, the allocated space was not enough to render the complete report. Try to remove sections from the report and run several smaller reports with the individual sections. Ask your administrator to increase the C-Stack value as described on the CRISPRAnalyzeR Github page. In most cases, especially for genome-wide screens, it is recommended to just select individual sections and run/download several reports. Your data files have been uploaded and checked successfully. As a next step, please go to the Data Review section. Your groups have been set succesfully. As a next step, please set your Analysis Parameters. CRISPRAnalyzeR has successfully run the analysis. You have reset the analysis. CRISPRAnalyzeR started with the re-evaluation of the sgRNAs. Please note that this will take some time - you will receive a notification once it has been finished. You can always check the progress of sgRNA re-evaluation on this page. Please proceed to the Screen Quality and Hit Calling Section. CRISPRAnalyzeR has successfully re-annotated your sgRNAs.